From this page, you can access open results from Andrea Tonello’s research. This is to follow the spirit of replicable research and open software. To access the publications, please visit publications. Statistical: the model represents the ensemble of channel responses in a certain scenario. Indoor – outdoor: in-building or for distribution/transmission grids. This is a phenomenological PLC statistical channel model that models directly the statistics of the channel frequency response. The model was presented in the papers below:  considers the SISO case; [2-3] report preliminary ideas to extend it to the MIMO case;  derives the final and improved fully synthetic model. A data base of 100 MIMO channel responses in the band 1-100 MHz generated according to  is available below. It consists of a Matlab data structure. A Matlab function is also available. 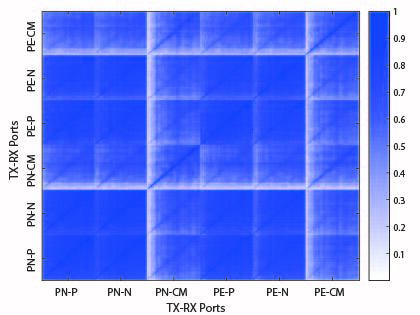 It allows to generate an arbitrary number of MIMO channels (according to ) from 1 x 1 up to 2 x 3 modes. Channels are statistically equivalent to those obtained from the ETSI Task Force 410 measurement campaign in Europe. The help function provides details on the script. Synthetic MIMO PLC Channel Data Base. Rel. 1.0, November 2016. download. Synthetic MIMO PLC Channel Emulation Software. Rel. 1.0, November 2016. download. The data base is freely usable for non commercial use provided that ,  are referenced and this web link is reported. 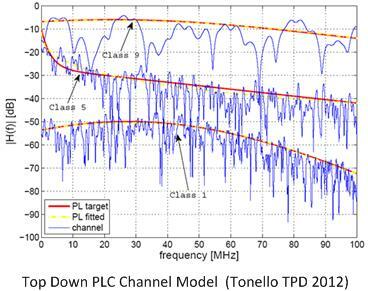 A. Pittolo, A. M. Tonello, “A Synthetic Statistical MIMO Power Line Communications Channel Model,” IEEE Trans. on Communications 2017. Preprint. Channel measurements are important to characterize the PLC channel. We have developed both measurement methodologies and statistical analysis tools. New results about the characterization of the in-home PLC channel can be found in . A Matlab code (Release 1.0) to analyse data according to  can be downloaded at the link below. The script computes the channel impulse response (CIR), the average channel gain (ACG), the RMS delay spread, and the deterministic coherence bandwidth at level 0.9 of the channel frequency response H defined at frequencies f. For further details, see . From the PLC Channel Measurements to the Statistics: A Matlab Script (August 2013). The software is freely usable provided that  is referenced. A. M. Tonello, F. Versolatto, A. Pittolo, “In-Home Power Line Communication Channel: Statistical Characterization,” IEEE Transactions on Communications, vol. 62, issue 6, pp. 2096-2106, June 2014. Top-down channel modeling refers to an approach where the channel impulse/frequency response is obtained with a parametric model with parameters obtained by fitting real data from measurements. The statistical top-down model allows generating channels with statistics identical to those exhibited by real channels. In particular, the model is simple, flexible, and it uses a small set of parameters. The parameters can be adjusted to generate channel according to a certain statistical class. For instance, we can classify channels according to their average path-loss, gain, delay spread, and capacity. The idea of statistical top-down modeling was originally presented in . Other details and improved versions can be found in -. A Matlab code (Release 1.0) and updates (Release 2.0, according to  and Release 3.0, according to ) can be downloaded at the links below. This software is freely usable for non commercial activities provided that  and  are cited and this web link is reported. Any use has to comply with the copyright terms. Any modification and/or commercial use has to be authorized by the copyright owner. A.M. Tonello, “Wideband Impulse Modulation and Receiver Algorithms for Multiuser Power Line Communications,” EURASIP Journal on Advances in Signal Processing, vol. 2007, pp.1-14. “Deliverable 3.2“, EU FP7 Omega Project. (Page 52). A. M. Tonello, “Brief tutorial on the statistical top-down PLC channel generator,” December 2010. A. M. Tonello, F. Versolato, B. Bejar, S. Zazo, “A Fitting Algorithm for Random Modeling the PLC Channel,” IEEE Trans. on Power Delivery, Vol. 27, n. 3, pp. 1477-1484, July 2012. Bottom-up channel modeling refers to an approach where the channel impulse/frequency response is obtained via the application of transmission line (TL) theory to a specified network topology, cables and loads characteristics. Conventionally, this approach is applied to obtain a specific response and it is also referred to as deterministic model. Further, for complex networks the existing calculation methods are rather complex. We have extended this idea in order to obtain an accurate statistical channel generator. This has been obtained by developing a realistic statistical description of in-home topologies. To overcome the computational effort in obtaining the channel responses, we have devised an efficient method for the computation of the channel transfer function. Some results about our bottom-up channel model can be found in -. The bottom-up simulator can be used for testing algorithms that require topology information. An example is network cooperative and relay protocols (see for instance ). A. M. Tonello, F. Versolatto, “Bottom-Up Statistical PLC Channel Modeling – Part II: Inferring the Statistics,” IEEE Trans. on Power Delivery, 2010. F. Versolatto, A. M. Tonello, “An MTL Theory Approach for the Simulation of MIMO Power Line Communication Channels,” IEEE Trans. on Power Delivery, 2011. A.M. Tonello, F. Versolatto, “New Results on Top-down and Bottom-up Statistical PLC Channel Modeling,” Proc. of Third Workshop on Power Line Communications (WSPLC 09), Udine, Italy, October 1-2, 2009. F. Versolatto, A. M. Tonello, “Analysis of the PLC Channel Statistics Using a Bottom-Up Random Simulator,” Proc. of IEEE ISPLC 2010, Rio De Janeiro, Brazil, March 28-31, 2010. ISPLC best student paper award. 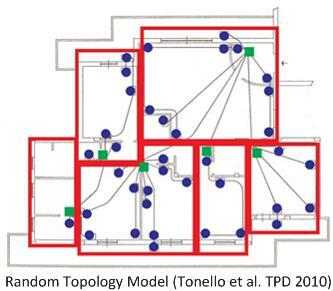 F. Versolatto, A. M. Tonello, “A MIMO PLC Random Channel Generator and Capacity Analysis,” Proc. ISPLC 2011, Udine, Italy, April 3-6, 2011. S. D’Alessandro, A. M. Tonello, “On Rate Improvements and Power Saving with Opportunistic Relaying in Home Power Line Networks,” EURASIP Journal on Advances in Signal Processing, 2012.